EUR/USD, waiting for the FED. 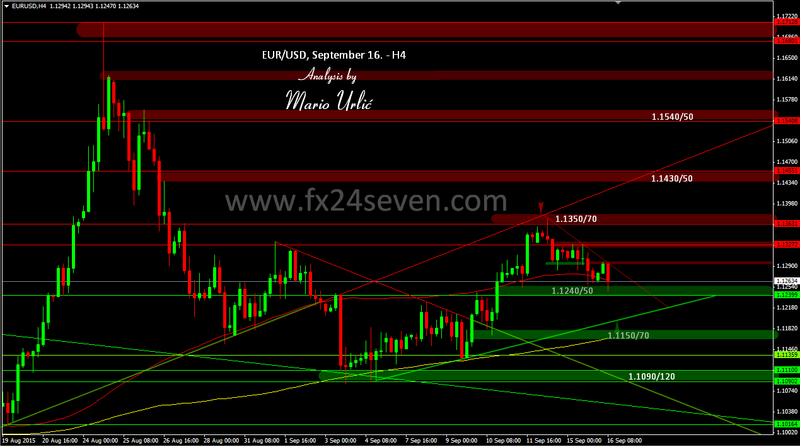 In my previous EUR/USD analysis from September 11. I pointed at this 1.1350/70 as an important for the bulls. The pair aproached ‘too easy’ on Monday at that level, after wich it wasn’t hard to hold the line for the bears. The euro bulls hold the first line at 1.1290/300 until Tuesday afternoon, after wich the bears reached the next line of defense at 1.1240/50. The bulls hold that line today for the second time but the pair don’t look bullish as you can see. Daily MA200 is placed near as well, at 1.1234 today and that could help the buyers, but the bears could search liquidity lower. Up trendline is placed at 1.1210, maybe that could be the turn point!? Well, tomorow is a very important day for US dollar, FED Interest Rate Decision, we could say the judgment day. It’s not easy to analyse the market day before important events like this one, all we can do is watch the big players and wait for the FED’s decision tomorow.